When a woman in Texas found that someone had broken into her car, she was shocked to learn it was the local police. Belton, TX — Several years ago, The Free Thought Project reported on the Rosenberg Texas Police Department attempting to break into cars to—get this—prevent thieves from breaking into cars. After we exposed the practice, we thought it had disappeared from modern policing tactics. We were wrong. Police in Belton, Texas, are now apparently following the example of the Rosenberg PD, and are going around checking citizens’ car doors to see if they are open or not. What may sound like a good idea to the police department, has left more than a few Belton residents upset over the perceived invasion of their privacy. According to the notice that was called a “Crime Awareness Alert,” Officer Kusak (badge number 226), of the Belton Police Department was patrolling the area and noticed Hendry’s car windows were down or open. We know this because he circled that information on the card. He then wrote in one of the blanks that the car’s registration was expired. While it may be tempting for citizens to thank Officer Kusak for checking to see if Hendry had locked her doors, the human condition coupled with the fact that police departments legally steal more assets from citizens than all the burglars in the U.S. combined should give any free thinking individual pause to consider the ramifications. First, for an officer to enter a person’s vehicle without a warrant is a clear violation of the citizen’s Fourth Amendment rights to be free from unlawful and unreasonable searches and seizures by so-called authorities. Second, rummaging through a person’s car promotes distrust between the police and the public. Third, in Texas, citizens have a right to defend their property with deadly force. It’s called the Castle Doctrine. If citizens notice a shadowy figure (many if not most cops wear black) going through their car and belongings, under certain circumstances, they could be within the law to open fire on the person. If that person is a police officer, then their job safety would be exponentially more dangerous if they attempt to prove a point by breaking into private vehicles. Also, as TFTP’s Matt Agorist reported in our first story, what if the police officer going through the person’s car were to find an illegal substance or drug? Would that officer be obligated to press charges against the individual or would they simply stop at leaving a notice that the car door or window was left open? Many police departments operate on a quota system and they are required to make a certain number of police “contacts” with the public. Is this what the Belton PD is doing to meet their quota system? If so, with the “check the doors and windows” method, they will be able to issue more citations, seize more property, add more assets to their operating budget, make more arrests, get more convictions, and separate more people from their funds by way of citations. And cop apologists will still say they are doing it to cut down on larceny. By the way, according to Hendry, Officer Kusak left her doors open after he broke into her car. In light of the simple fact that he checked to see if her car had a valid registration, it is safe to conclude he was in her car for more reasons than just making sure her car was secure. Hendry admitted that her car had been parked outside her home for several months as it was broken and in need of repair, which explains the expired registration. Please be advised, State statute prohibits ANY Texas municipality from requiring the owner of an automobile to REGISTER it with the State. This automobile is parked in the proximity of my home in a family dwelling neighborhood and is NOT abandoned. Therefore, no authority exists for you to tamper with or steal my private property. Please leave it alone. Sec. 502.003. REGISTRATION BY POLITICAL SUBDIVISION PROHIBITED. Hendry could simply not believe that a police officer would go inside her vehicle, tamper with her belongings, and then leave a note saying what they had done. She said she intends to file a complaint with the police department. We will bring you more updates to her story as they become available. UPDATE: After this story ran, the Belton police went to local media to claim that it was baseless. Despite knowing that her registration was expired—meaning he went through her paperwork—the officer claims someone must’ve broken into the car after he did his good deed. The department said an officer was on patrol at 2:20 a.m. Monday and found the woman’s vehicle unlocked with its windows down. 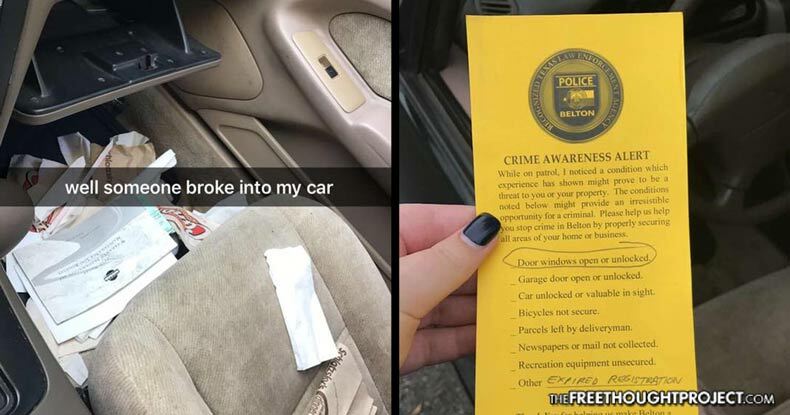 As a courtesy, Belton Police said the officer wrote up a crime awareness reminder and left it on the woman’s vehicle — without ever going inside — and continued on with his duties. Sometime after that happened, the woman’s vehicle was actually entered and rummaged through, according to police. “There were several other car burglaries in the area overnight, and suspects have been identified and charges are pending in connection with the thefts,” Belton Police Chief Gene Ellis said in a statement.